008. ROBERT F. SCOTT. Issued by J. LYONS & CO. LTD. (1966). It is card #8 from a set of 48 cards entitled "Famous People". Size: 2.7-" x 1.4". 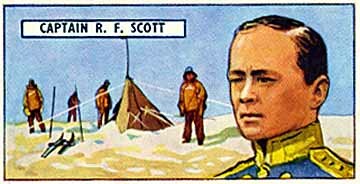 Recto: Head and shoulders depiction of Scott in naval uniform. In the background are 4 members of the polar party at Amundsen's tent at the pole. Title upper left: Captain R. F. Scott.